Right from the very beginning, even a small-time promotional activity of Remo has worked big time for the team. Be it 24AM Studios’ unique way of announcing the cast and crew details or the recent mascot campaign at theatres, they have all made a definite impact among moviegoers. And with Remo’s songs and trailer having fetched some great response, it was certain that the film would take a very good opening at the box office. Sivakarthikeyan’s career is clearly on the uptrend and he is able to single-handedly pool in people to the theatres. Without any doubt, he is a bankable star and he has managed to acquire a high success streak till now. But who would have expected 5AM shows for Remo, which is something reserved only for top superstar films? Even the trade pundits wouldn’t have foreseen this coming. We believe this is because of the collective team effort from the Remo team. They have been very meticulous in planning and execution. They had fixed the release date well in advance, had a solid promotional campaign and now it’s time for them to reap for their efforts. We also hear Remo has got the much-needed tax exemption from the Tamil Nadu state government which is surely going to work in the film's favor. Wow! Sivakarthikeyan and Sathish did this also!!! This page hosts a weekly slideshow related to Tamil movies. Each slide includes a picture and some description about that picture. All the slides will have a recurring theme. People looking for actress stills, actress images, actor stills, actor images, movie stills, movie images, and other interesting topics, relevant issues in Tamil cinema will find this page useful. AFTER TOP SUPERSTARS, SIVAKARTHIKEYAN NOW RECEIVES THIS HONOUR! 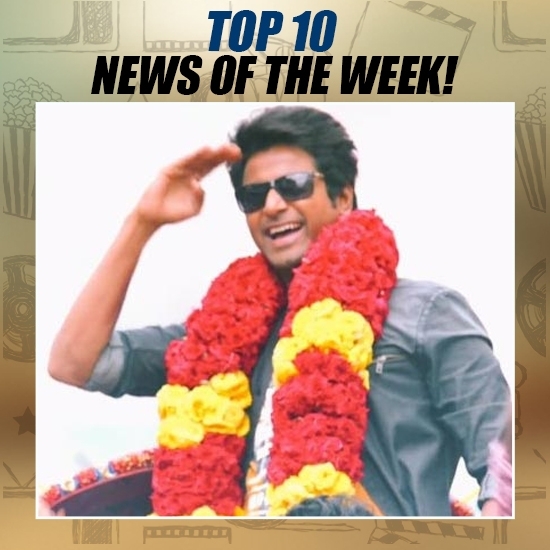 | Top 10 news of the week (Oct 2 - Oct 8).